The de facto division of the island in 1974 left the Turkish Cypriot community in the north in possession of agricultural resources that produced about four-fifths of the citrus and cereal crops, two-thirds of the green fodder, and all of the tobacco. The south retained nearly all of the island's grapegrowing areas and deciduous fruit orchards. The south also possessed lands producing roughly three-fourths of the valuable potato crop and other vegetables (excluding carrots), half the island's olive trees, and two-thirds of its carob trees. 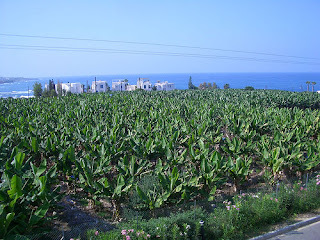 The climate on Cyprus and neighbouring Greek islands like Crete is perfectly suited for growing bananas. 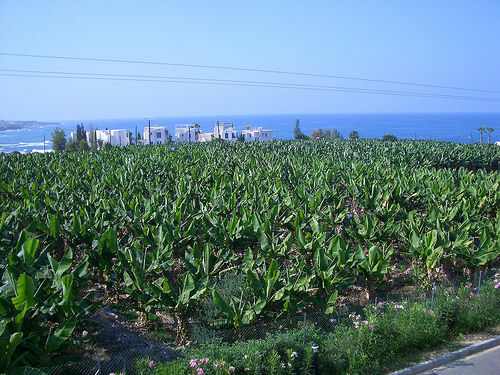 Bananas grow rather unruly on pretty much the whole of island Cyprus, but are grown primarily on banana plantations around Paphos on the southwest coast of Cyprus and the Güzelyurt area in Turkish Cypriot territory. They stretch along the coast up to the mountains. All products are supplied to the domestic market and have good demand. It has been found that the young banana leaves can help to heal burns and wounds. Most of the harvest is destined for Cypriot consumers. Smugling cheaper South-American bananas via northern Turkish-Cyprus is rife.